On May 26th NATEK Wroclaw Team was at InfoMeet – a conference and IT job fairs. We were a partner of the event already for the third time. NATEK was a Silver Partner of the event which was attended by over 600 people, mostly by developers specialising in Java, .Net, iOS, C++, C#, by testers and network administrators. Our recruiters talked to the job seekers about career opportunities and HR Operation Consultant Joanna Sakowicz presented the company on stage. 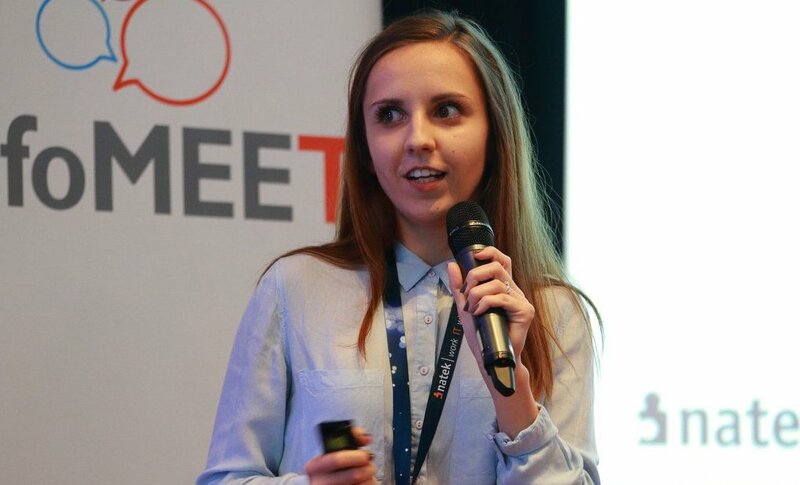 “What we saw is that for many people their job is their passion”, says IT Recruiter Daria Butenko. “If you are wondering whether a particular position is the right one for you, such events are a great opportunity to learn more about it. Come to the fairs, listen to the presentation of the company and ask as many questions as possible. And don’t forget to bring your CV with you!”, Daria explains. InfoMEET is a free, cyclical event organised regularly in several Polish cities. It’s main goal is to provide the opportunity to gain knowledge and meet like-minded people. In the expo area partners can present their current job offers. This edition was organised in Mercure Hotel in Wroclaw. Do you want to work in Wroclaw? Check our latest career opportunities at www.natek.eu/careers/ or contact Daria at daria.butenko@natek.pl.